January 16, 2006 / I wonder what it was like to belong to one of the privileged research units (probably mostly in engineering and the sciences) whose office was populated by a dozen or so of these now-classic little beige boxes, blipping electrons at each other over the copper phone lines that comprised the “Phonenet" campus network. 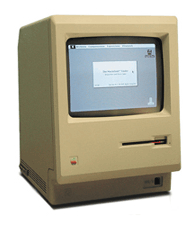 Most computer users at Yale in the late 80s used Macs. I wonder what it was like to belong to one of the privileged research units (probably mostly in engineering and the sciences) whose office was populated by a dozen or so of these now-classic little beige boxes, blipping electrons at each other over the copper phone lines that comprised the “Phonenet” campus network. For the last two-and-a-half years I have been the part-time “Local Tier 1” support person for my department (the Department of Sociology). On the ground this position title is, of course, known to approximately two people (me and the Business Manager). To everyone else I was the “computer guy.” As Computer Guy (I got the job because I was interested and because I knew how to open and close Word documents on both a Windows PC and a Mac) I learned my job whenever someone had a problem, or whenever new equipment had to be added to the network and made ready for use. I actually like working with PCs. My first experience with computers was with PCs, not Macs, in large part because the cost of a new Mac exceeded what my parents were willing to pay for our family’s first computer (a Samsung 386 SX running at 16 MHz, with a 40 MB hard drive), but also because your chances of being exposed to a Mac in Brisbane in the early 90s were probably small unless someone you knew went to university or worked at one. Cost also kept me away from Macs until I moved to the U.S. in 2002, whereupon I sold my first car (a lovingly cared-for green ’78 Honda Accord) to my brother in July and bought Moses a month later in New York City. To those who know me (and my computer) I should qualify the above statement by adding that there are definitely things that I don’t like about PCs, and about which I have been known to complain incessantly from time to time. But the point is simply to reflect on what my part-time job at Yale might have been like if it had existed in the late-1980s (or conversely, if everyone at Yale used Macs today). I suspect that in the former scenario I would have acquired much less transposable knowledge than in the latter one—as the above-mentioned ITS article explains, Phonenet was designed to facilitate the emerging Appletalk network protocol. Subsequent system upgrades (for example the move to campus-wide Ethernet) also corresponded in a profusion of network technologies, and no doubt a decline in the ratio of talking Apples! In contrast to the Mac ’80s, and the PC ’90s, the “Universal ’00s” are seeing a high level of Mac-Windows integration, to filch a term from the web site of the same name. Apple’s move from the wholly proprietary OS 9 to the UNIX-based OS X has done a lot to further such convergence. Additionally, both Microsoft’s and Apple’s implementations of LDAP directory services (Microsoft’s Active Directory and Apple’s Open Directory) are structurally and functionally integrated enough that OS X clients can authenticate on Microsoft-managed network environments and Windows XP and 2000 clients can do the same on Apple-managed networks. From my point of view as Mr. “Local Tier 1” the Yale network was a beast that simply opened up its gigantic maw to admit any kind of client computer with casual ease—whatever the faculty member for whom it was purchased had preferred—although the network is ultimately controlled by some heaving Windows boxes at the very highest levels. Instead of an elaborately structured and hierarchicalised collection of centrally-authenticated network devices, the casual observer, strolling around the department, might simply notice that over here some people are using PCs, and over there—well, that professor has a very handsome computer indeed.